Light up any party with the Micro Star laser. 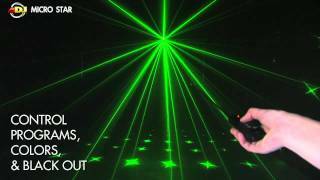 This green and red laser produces more than 200 beams with star patterns that may be projected on a wall, ceiling or dance floor. This laser is safe to use and complies with FDA standards. The Micro Star is easy to use – just plug it in and run the laser’s built-in lighting programs in Auto or Sound Active mode. Change programs, colors and black out with the included remote control. The Micro Star’s compact, light weight case design makes it ideal for mobile entertainers, bands, night clubs and bars or any party goers! Considering purchasing the American DJ Micro Star Multi Coloured Laser? Have questions? Ask people who've recently bought one. Do you own the American DJ Micro Star Multi Coloured Laser? Why not write a review based on your experience with it. 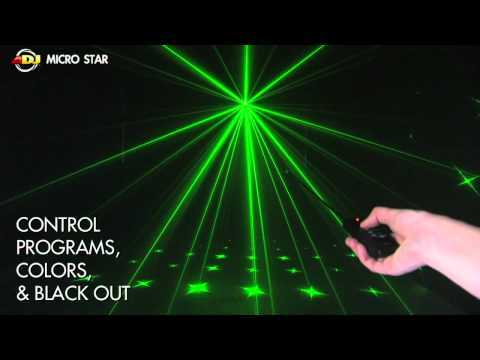 Seen a video for American DJ Micro Star Multi Coloured Laser online or have you own video? Check out American DJ Micro Star Multi Coloured Laser on DJkit.com!